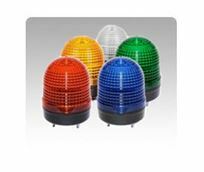 Menics 86mmø ultra-bright xenon strobe lights are useful in various industrial applications. Available in 12-24VAC/DC, 110VAC, & 220VAC, it can be stud mounted, direct mounted or wall mounted. Easily replaceable PCB module style xenon lamp provides high brightness and outstanding visibility at distance. The prism-cut dome-shaped lens (available in Red, Blue, Green, Yellow, & Clear color) provide wide light distribution.